Cable protector hire can often be more expensive than buying! A budget solution to the problem of cable hazard in offices and other workplaces. Please view the video below for further information on how the protector works and for a close-up view of the cable cover product. Note: Comes in 9m roles, so if the order is larger it will come as 9m + the difference, unless you state otherwise. Highly economical way to protect your staff from tripping over cables whilst at the same time allowing for carts / trolleys to pass smoothly over the cable. 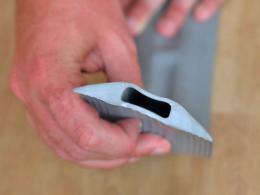 This cable protector is easy to install and can be cut at the base to allow cable to be inserted. The product is fire and shock retardant and does not have unpleasant smells being made of PVC rather than rubber - which also makes the product very durable. 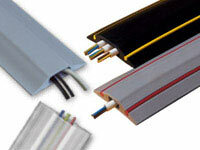 Along with cable tidies, they are a very cost effective cable safety solution. What is the purpose of a Universal Budget Internal Cable Protector? Exposed cables often prove to be trip hazards at the workplace. In addition, the cables themselves are susceptible to damage if left exposed, especially if they run across walkways or corridors. The universal budget internal cable protector affords full protection and safety – both for the cables as well as for people who regularly cross over them. This cable management system allow feet, chairs or trolleys to pass over in complete safety. Our cable protectors are easy to install: just make a slit at the base of the protector to allow the cables to be inserted and place it right there on the floor or carpet. There’s no need to actually run the cables through during installation. Just slit and place, and your cables (and people) are well-protected. Where can a Universal Budget Internal Cable Protector be used? The universal budget internal cable protector is an ideal choice of cable protection whether it is a question of protecting one cable, or a set of cables. 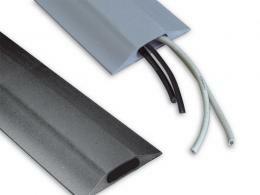 The protectors are made of highly flexible PVC, which allows you to protect your cables no matter which way they run. 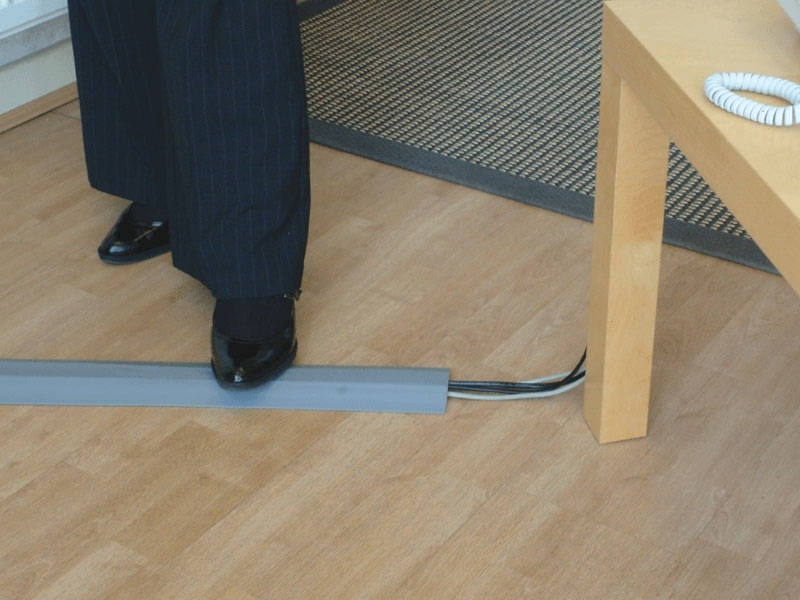 Many of our customers consider this product to be the most economical way of protecting their office staff from tripping over cables; moreover the protector gives safe passage to trolleys as well as chairs fitted with castors. In case of a fire, our cable protectors produce much smaller amounts of smoke and smell compared to cable protectors made of rubber. Who might use a Universal Budget Internal Cable Protector? These universal budget internal cable protectors are essential wherever there are exposed wires and cables that could prove to be trip hazards. In addition to safety, these protectors help keep your cords organized and tangle-free, and help you get rid of “the cluttered look.” At home, exposed wires are not only unseemly and inconvenient, but it is a major safety concern where smaller children or pets are involved. This wire cover can prevent accidents by keeping both your cables and your loved ones safer. Our universal budget internal cable protector is 9m of high-grade, flexible PVC, with gently slopped edges that allow people, castor chairs, hand trucks and trolleys to pass over this cable ramp safely and easily. It has a large central chamber (28x10mm) which is suitable for multiple cables. It is made of fire retardant PVC with no "rubbery" odour. Simply making a slit on the underside makes cable insertion a quick and easy task. The protector is 80mm wide and 14mm high, and is supplied in a 9m coil that easily cuts to any desired length. The Workplace Depot offers a standard one-year warranty on all parts and labour. Our universal budget internal cable protectors fully comply with all local council and government regulative manufacturing requirements to ensure the safety of your customers and staff. Did you know that there is an International Cable Protection Committee? This committee, however, is not for ordinary cables that we see in our daily lives. It is an 86-member group whose objective is to control damage to underwater communications cables. According to the association, 95% of transcontinental telecom and network traffic is carried by undersea cables.